With the advent of cell phone PDAs with larger screens and photo/video capture, people who communicate with American Sign Language (ASL) could utilize these new technologies. However, due to the low bandwidth of the U.S. wireless telephone network, even today's best video encoders likely cannot produce the quality video needed for intelligible ASL. Instead, a new real time video compression scheme is needed to transmit within the existing wireless network while maintaining video quality that allows users to understand semantics of ASL with ease. 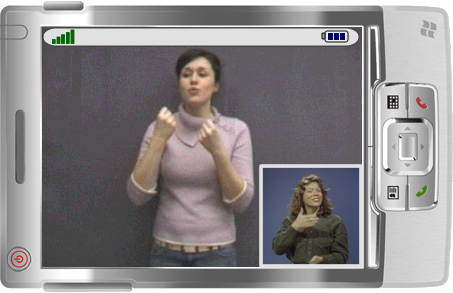 The MobileASL team has been working to optimize compressed video signals for sign language. By increasing image quality around the face and hands, researchers have brought the data rate down to 30 kilobits per second while still delivering intelligible sign language. MobileASL also uses motion detection to identify whether a person is signing or not in order to extend the phones' battery life during video use. High-end phones, such as the iPhone 4 and the HTC Evo, offer video conferencing but broadband companies have blocked the bandwidth-hogging video conferencing from their networks, and are rolling out tiered pricing plans that would charge more to heavy data users. The UW team estimates that iPhone's FaceTime video conferencing service uses nearly 10 times the bandwidth of MobileASL. Even after the anticipated release of an iPhone app to transmit sign language, people would need to own an iPhone 4 and be in an area with very fast network speeds in order to use the service. The MobileASL system could be integrated with the iPhone 4, the HTC Evo, or any device that has a video camera on the same side as the screen. See UW Press Release for more details. National Science Foundation, with additional gifts from Sprint Nextel Corp., Sorenson Communications and Microsoft Corp.